Beta Crateris, Latinized from β Crateris, is a binary star system in the southern constellation of Crater. It is visible to the naked eye with an apparent visual magnitude of 4.46. Based upon an annual parallax shift of 9.59 mas as seen from Earth, it is located around 340 light years from the Sun. This is an astrometric binary star system with an orbital period of 6.0 years and a projected separation of 8.3 AU. The orbit has an estimated semimajor axis of 9.3 AU. The primary, component A, is listed as an A-type giant star with a stellar classification of A2 III. However, Houk and Smith-Moore (1988) give a main sequence classification of A1 V, while Abt and Morrell (1995) list it as a subgiant star with a class of A2 IV. The spectrum shows enhanced barium, possibly as a result of a previous mass transfer event. The companion, component B, is a white dwarf of class DA with an effective temperature of 36,885 K that has been cooling down for around four million years. It has an unusually low mass, 43% that of the Sun, suggesting that the white dwarf progenitor may have transferred matter to its companion. Alternative scenarios require either the evolution of a triple star system, or a binary system with highly eccentric orbit resulting in grazing interactions. The dwarf is a source of X-ray emission. β Crt, 11 Crateris, BD−22° 3095, FK5 421, HD 97277, HIP 54682, HR 4343, SAO 179624, WD 1109-225. 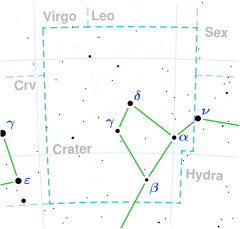 This star was one of the set assigned by the 16th century astronomer Al Tizini to Al Sharāsīf (ألشراسيف), the Ribs (of Hydra), which included the stars from β Crateris westward through κ Hydrae. According to the catalogue of stars in the Technical Memorandum 33-507 - A Reduced Star Catalog Containing 537 Named Stars, Al Sharāsīf were the title for two stars : β Crateris as Al Sharasīf II and κ Hydrae as Al Sharasīf I. ^ a b van Leeuwen, F. (2007), "Validation of the new Hipparcos reduction", Astronomy and Astrophysics, 474 (2): 653–664, arXiv:0708.1752, Bibcode:2007A&A...474..653V, doi:10.1051/0004-6361:20078357. ^ a b c d Mermilliod, J.-C. (1986), "Compilation of Eggen's UBV data, transformed to UBV (unpublished)", Catalogue of Eggen's UBV data, SIMBAD, Bibcode:1986EgUBV........0M. ^ a b c d e f g h i Holberg, J. B.; et al. (2013), "Where are all the Sirius-like binary systems? ", Monthly Notices of the Royal Astronomical Society, 435 (3): 2077, arXiv:1307.8047, Bibcode:2013MNRAS.435.2077H, doi:10.1093/mnras/stt1433. ^ a b McDonald, I.; et al. (2012), "Fundamental Parameters and Infrared Excesses of Hipparcos Stars", Monthly Notices of the Royal Astronomical Society, 427 (1): 343–57, arXiv:1208.2037, Bibcode:2012MNRAS.427..343M, doi:10.1111/j.1365-2966.2012.21873.x. ^ a b Smalley, B.; et al. (January 1997), "The chemical composition and binarity of beta Crateris", Monthly Notices of the Royal Astronomical Society, 284 (2): 457–464, Bibcode:1997MNRAS.284..457S, doi:10.1093/mnras/284.2.457. ^ Royer, F.; et al. (February 2007), "Rotational velocities of A-type stars. III. Velocity distributions", Astronomy and Astrophysics, 463 (2): 671–682, arXiv:astro-ph/0610785, Bibcode:2007A&A...463..671R, doi:10.1051/0004-6361:20065224. ^ a b c Burleigh, M. R.; et al. (November 2001), "The low-mass white dwarf companion to β Crateris", Monthly Notices of the Royal Astronomical Society, 327 (4): 1158–1164, arXiv:astro-ph/0106463, Bibcode:2001MNRAS.327.1158B, doi:10.1046/j.1365-8711.2001.04818.x. ^ a b c Barstow, M. A.; et al. (May 2014), "Evidence for an external origin of heavy elements in hot DA white dwarfs", Monthly Notices of the Royal Astronomical Society, 440 (2): 1607–1625, arXiv:1402.2164, Bibcode:2014MNRAS.440.1607B, doi:10.1093/mnras/stu216. ^ "bet Crt". SIMBAD. Centre de données astronomiques de Strasbourg. Retrieved 2017-03-02. ^ a b Eggleton, P. P.; Tokovinin, A. A. (September 2008), "A catalogue of multiplicity among bright stellar systems", Monthly Notices of the Royal Astronomical Society, 389 (2): 869–879, arXiv:0806.2878, Bibcode:2008MNRAS.389..869E, doi:10.1111/j.1365-2966.2008.13596.x. ^ Houk, Nancy; Smith-Moore, M. (1978), Michigan catalogue of two-dimensional spectral types for the HD stars, 4, Ann Arbor: Dept. of Astronomy, University of Michigan, Bibcode:1988mcts.book.....H.
^ Abt, Helmut A.; Morrell, Nidia I. (1995), "The Relation between Rotational Velocities and Spectral Peculiarities among A-Type Stars", Astrophysical Journal Supplement, 99: 135, Bibcode:1995ApJS...99..135A, doi:10.1086/192182. ^ Schröder, C.; Schmitt, J. H. M. M. (November 2007), "X-ray emission from A-type stars", Astronomy and Astrophysics, 475 (2): 677–684, Bibcode:2007A&A...475..677S, doi:10.1051/0004-6361:20077429. ^ Rim Turkmani. "Arabic Roots of the Scientific Revolution". Muslim Heritage. Retrieved 1 July 2016. ^ Rhoads, Jack W. (November 15, 1971), Technical Memorandum 33-507-A Reduced Star Catalog Containing 537 Named Stars (PDF), Jet Propulsion Laboratory, California Institute of Technology. Kaler, James B. (May 22, 2015), "Beta Crateris", Stars, University of Illinois, retrieved 2017-03-03. Alpha Crateris (α Crateris, abbreviated Alpha Crt, α Crt), officially named Alkes , is a star in the constellation of Crater. It is a cool giant star about 43.2 parsecs (141 ly) away. Crater is a small constellation in the southern celestial hemisphere. Its name is the latinization of the Greek krater, a type of cup used to water down wine. One of the 48 constellations listed by the second-century astronomer Ptolemy, it depicts a cup that has been associated with the god Apollo and is perched on the back of Hydra the water snake. There is no star brighter than third magnitude in the constellation. Its two brightest stars, Delta Crateris of magnitude 3.56 and Alpha Crateris of magnitude 4.07, are ageing orange giant stars that are cooler and larger than the Sun. Beta Crateris is a binary star system composed of a white giant star and a white dwarf. Seven star systems have been found to host planets. A few galaxies, including Crater 2 and NGC 3981, and a quasar lie within the borders of the constellation. Epsilon Crateris (ε Crateris) is a solitary star in the southern constellation of Crater. Visible to the naked eye, it has an apparent visual magnitude of 4.84. It is located in the sky above Beta Crateris, and slightly to the left, or east, marking the lower right edge of the rim of the bowl and is somewhat closer to Theta Crateris, which is further east at the top of the bowl. With an annual parallax shift of 8.67 mas as seen from the Earth, its estimated distance is around 376 light years from the Sun. This is an evolved K-type giant star with a stellar classification of K5 III. It has about the same mass as the Sun, but has expanded to 44.7 times the Sun's radius. The star is radiating 391 times the solar luminosity from its outer atmosphere at an effective temperature of 3,930 K.
NGC 3511 is an intermediate spiral galaxy located in the constellation Crater. It is located at a distance of circa 45 million light years from Earth, which, given its apparent dimensions, means that NGC 3511 is about 70,000 light years across. It was discovered by William Herschel on December 21, 1786. It lies two degrees west of Beta Crateris.NGC 3511 features two very diffuse, thick, and patchy spiral arms that emanate from the bulge, while there are also other spiral arm fragments. Dark dust lanes can be seen across the spiral pattern. The bulge appears elliptical and is weak. The galaxy is seen at a high inclination, estimated to be 70°. In the centre of the galaxy lies a supermassive black hole, whose mass is estimated to be 106.46 ± 0.33 (1.3 - 6.2 million) M☉, based on the pitch angle of the spiral arms. The galaxy had been classified as a type 1 Seyfert galaxy, however it features only narrow emission lines, and has been reclassified as a HII region galaxy. The Infrared Spectograph (IRS) on the Spitzer Space Telescope has detected polycyclic aromatic hydrocarbon (PAH) emission.NGC 3511 forms a pair with NGC 3513, which lies 10.5 arcminutes away from NGC 3511. The two galaxies form a small group, known as the NGC 3511 group, which also includes the galaxy ESO 502-024. Sirius (, a latinisation of Greek Σείριος, Seirios, lit. "glowing" or "scorching") is a binary star and the brightest star in the night sky. With a visual apparent magnitude of −1.46, it is almost twice as bright as Canopus, the next brightest star. The system has the Bayer designation α (Alpha) Canis Majoris. The binary system consists of a main-sequence star of spectral type A0 or A1, termed Sirius A, and a faint white dwarf companion of spectral type DA2, designated Sirius B. The distance between the two varies between 8.2 and 31.5 astronomical units as they orbit every 50 years.Sirius appears bright because of its intrinsic luminosity and its proximity to Earth. At a distance of 2.6 parsecs (8.6 ly), as determined by the Hipparcos astrometry satellite, the Sirius system is one of Earth's near neighbours. Sirius is gradually moving closer to the Solar System, so it will slightly increase in brightness over the next 60,000 years. After that time, its distance will begin to increase, and it will become fainter, but it will continue to be the brightest star in the Earth's night sky for the next 210,000 years.Sirius A is about twice as massive as the Sun (M☉) and has an absolute visual magnitude of +1.42. It is 25 times more luminous than the Sun but has a significantly lower luminosity than other bright stars such as Canopus or Rigel. The system is between 200 and 300 million years old. It was originally composed of two bright bluish stars. The more massive of these, Sirius B, consumed its resources and became a red giant before shedding its outer layers and collapsing into its current state as a white dwarf around 120 million years ago.Sirius is also known colloquially as the "Dog Star", reflecting its prominence in its constellation, Canis Major (Greater Dog). The heliacal rising of Sirius marked the flooding of the Nile in Ancient Egypt and the "dog days" of summer for the ancient Greeks, while to the Polynesians, mostly in the Southern Hemisphere, the star marked winter and was an important reference for their navigation around the Pacific Ocean. Zeta Crateris (ζ Crateris) is a probable binary star system in the southern constellation of Crater. Zeta Crateris appears to be about half-way between Epsilon Corvi to the southeast and Beta Crateris to the northwest, and marks the lower left corner of the rim of the bowl. Eta Crateris lies somewhat less than half of the way from Zeta Crateris to Gamma Corvi, the bright star above, (north) of Epsilon Corvi. Zeta Crateris is a photometrically constant system that is visible to the naked eye with an apparent visual magnitude of 4.740. With an annual parallax shift of 9.24 mas as viewed from Earth, Zeta Crateris is located roughly 350 light years from the Sun. At that distance, the visual magnitude of the system is diminished by an extinction factor of 0.21 due to interstellar dust.The two components of this system had an angular separation of 0.20 arc seconds along a position angle of 22°, as of 1991. The primary, component A, is a magnitude 4.95 evolved giant star with a stellar classification of G8 III. It is a red clump star that is generating energy through the fusion of helium at its core. Zeta Crateris has expanded to 13 times the radius of the Sun and shines with 157 times the Sun's luminosity. This energy is being radiated into outer space from the outer envelope at an effective temperature of 4,992 K.The secondary, component B, is a magnitude 7.84 star. Zeta Crateris is a confirmed member of the Sirius supercluster and is a candidate member of the Ursa Major Moving Group, a collection of stars that share a similar motion through space and may have at one time been members of the same open cluster.